Richard Gamarra was just 16 when he was caught with a loaded handgun on campus at his Catholic high school in Queens. This first arrest was followed by a decade in and out of prison. Both Richard's parents were medical professionals in their native Colombia, immigrants who tried to impress upon their five children the value of education. But Richard fell in with the wrong crowd, an infamous crowd: the Latin Kings gang of New York. It was his daughter, Izabella, who motivated him to turn his life around. “It broke my heart to see my daughter trying to touch me through the glass. I remember [her] trying to squeeze through this 12-by-5 slot, trying to get to me. That really broke me. I said to myself, 'I need to go home to that girl.'" Fortunately, an inspirational professor in the prison's educational program had already noticed Richard. Robert Fullilove, a Columbia professor who works with the Bard Prison Initiative described Richard as "curious, extremely bright, [an] excellent writer." "A couple of good students always stand out," Fullilove recalled in an interview. "I told him, 'Come to Columbia. I'll make it happen.'" But it was Richard who "made it happen," taking every public health class the program offered and more than living up to the potential Fullilove saw in him. Richard earned his GED and AA in prison. 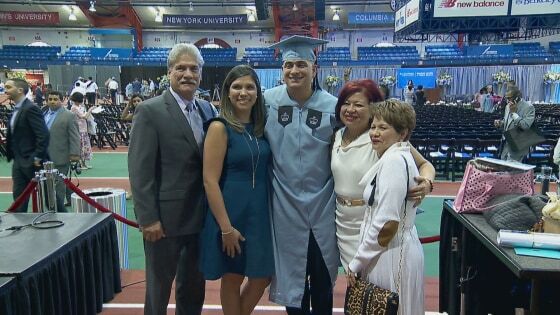 After his release, he went on to receive his bachelor's degree from the City University of New York in 2015, and enrolled in Columbia University that same fall to pursue his master's degree in Public Health. Richard graduated last year, with his parents, daughter, and professor Fullilove in attendance. The 29-year-old now works for the New York City Department of Health and Mental Hygiene as a researcher, helping shape policy for inmates with serious medical and mental health conditions. “Education is what’s going to help you get ahead in this country. Education is what’s going to save you."